Three stories about people whose curiosity, skill, likeable ambition and artfulness shape the way they live and work in China. Engineer Xiaohui Zhou builds audio equipment that is “better than the original.” He finds the blueprints online, the high-end components on scrapheaps, and the customers via an online store. Ruilin Wang, a long-time entrepreneur, also follows the Chinese recipe for copying. He develops machines and works with a Swiss partner who chose to merge with Ruilin’s firm rather than filing patent suits against it. Drone builder Chuan Angelo Yu and his team are dreaming big: they want to be accepted into the global community of high-tech pioneers, and travel to California to seek their fortune. Renowned documentary filmmaker Jürg Neuenschwander made his name with films such as The Power of Healing, Encounters on the Milky Way, and Sooner or Later. 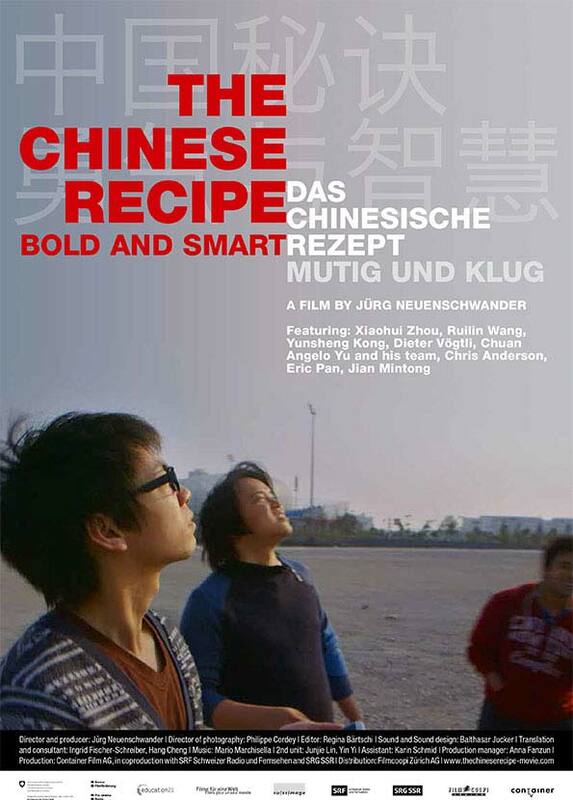 After spending six years in Shanghai, he has returned to Switzerland with a new film, The Chinese Recipe – Bold and Smart. The stories, which unfold in the midst of daily Chinese life, do not disprove the facts that dominate the West’s image of China. This is a country full of concrete metropolises growing at breakneck speed and causing disastrous air pollution. This is an economy that copies anything that is developed anywhere in the world; that supplies the West with more and more technologically sophisticated consumer goods and components for brand-name products; that – thanks to massive trade surpluses in the U.S., Europe, and Africa – buys up service and industrial corporations, and swathes of raw materials regions and agricultural land. And this is a state that keeps its citizens under strict control. In The Chinese Recipe – Bold and Smart, Jürg Neuenschwander reveals what this – not false, but rather narrow – image conceals: people. Optimistic, inquisitive, witty, warm-hearted, hard-working individuals. The film sees Neuenschwander take a knowledgeable, fascinating, and entertaining look behind the scenes. In doing so, he makes no claims to universality. Not all Chinese people are like this. But in a country that is home to billions, at lot probably are.